Many iPhone 3G users would like to use internet on a desktop or notebook through their phone. There were several solutions: iPhoneModem, NetShare, 3Proxy.. they all used SSH and SOCKS proxy. One of the working ones was described here get internet on a desktop or notebook through IPhone 3G. 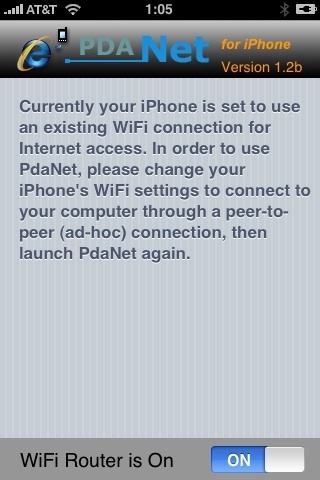 Couple days ago PdaNet (fullname is PdaNet WiFi Router) was ported to iPhone. Now our life is much much easier. What you need is a jailbreaked iPhone with Cydia installer. Then install PdaNet. All you need to do is simply to create an ad-hoc WiFi network on the computer and connect your iPhone to it (instructions). Your computer then goes online automatically. There is no need to specify IP (or any other) settings on either end. You will get FULL Internet access on the computer! (Instead of only applications that support Socks proxy.) In technical terms, all applications make direct TCP/IP connections to the server. Since there is no proxy involved, that also means less problems and less delays. You don't need to configure anything on the computer end whenever you connect PdaNet. No proxy settings, no extra software installation, no messing with static IP assignment, no switching settings back and forth when going back to your home's WiFi router. Yes it will connect at 3G speed if your phone has the coverage. Supports PC, MAC, Linux or anything (include other PDA/phones) that connects to a WiFi router. PdaNet runs in the background so you can still use other iPhone features when PdaNet is connected. But when you are done with them, go back to PdaNet to prevent the phone from entering idle and drops your connection. To turn off the phone screen when using PdaNet, just cover the upper part of the phone (or simply flip the phone upside down). This will conserve your battery. It is recommended that you charge the phone at the same time while using PdaNet, because both WiFi and 3G will be put on full speed, both consume a lot of juice. One last note: over-usage of PdaNet’s tethering is likely to draw the eye and the ire of AT&T (if you use this provider), so use with care!